I am really excited to be participating in a Christmas Sensory Play series this holiday season with several wonderful and creative friends! Each week we'll be sharing different holiday activities using our senses! This week we are using our sense of sight to build a beautiful and colorful photo Christmas tree for babies and toddlers! 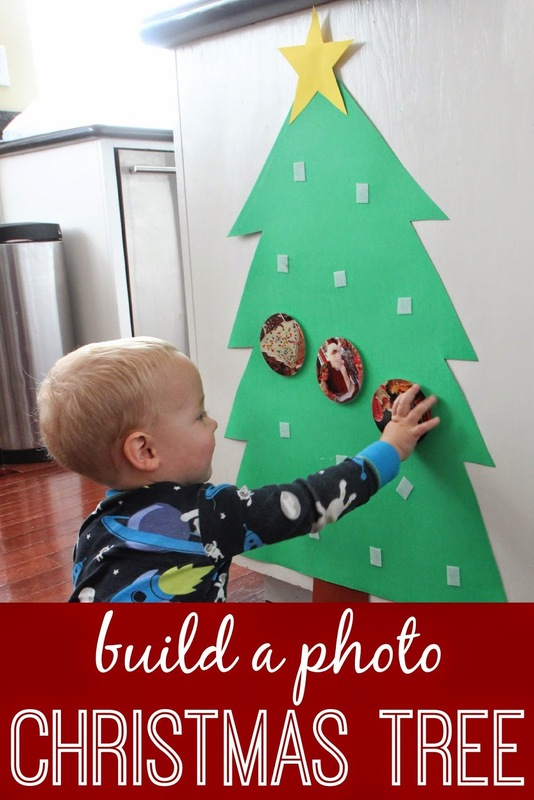 This photo Christmas tree activity is a fun way to talk about your favorite family Christmas traditions and even help babies learn family member's names. We built a photo garden last Spring that was also a hit with our little one! Often I find that I put Christmas pictures on Instagram or Facebook but I forget to print them out and hang them up for my kids to see. 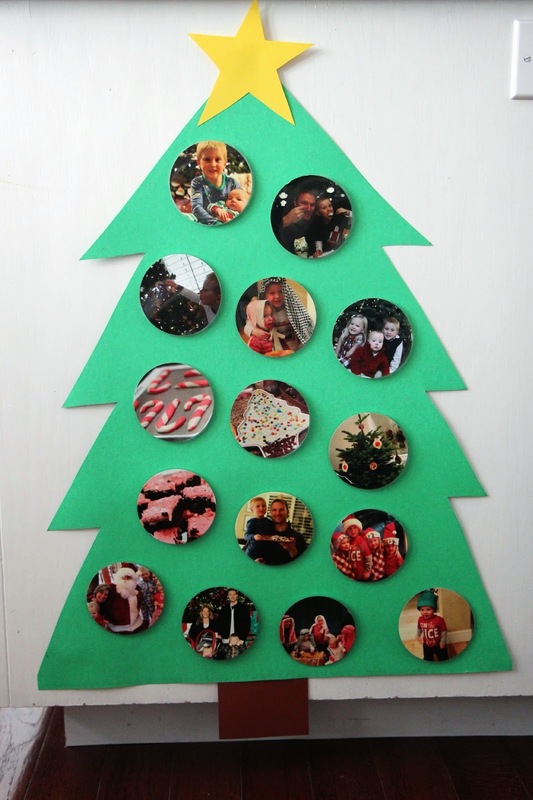 Kids can move the photos around, show you their favorite activities, and you can even use this photo tree as you plan your upcoming holiday activities for this season. Photos are such a great way to help little ones build vocabulary and language skills too. I was amazed how many new words we introduced to my toddler as we played with our tree! To get started you need to print out your photos and use a circle punch (or scissors) to cut them into circular shapes so that they look like ornaments. After than you want to laminate the photos since they'll be touched a lot by little fingers and you don't want them to get ripped right away! 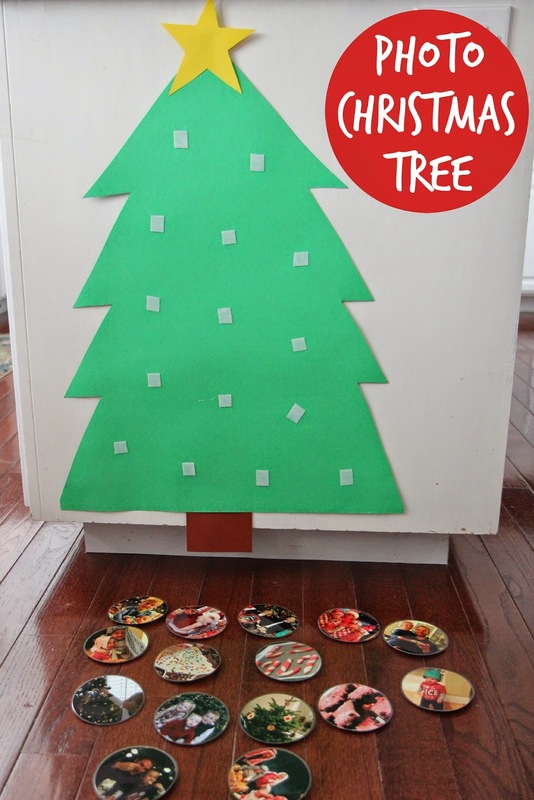 While the circles are being laminated, cut out a Christmas tree from posterboard. Add a star and a tree trunk using some cardstock and tape it into place. Once the circles are laminated, cut around them. Then you'll want to add velcro pieces to the christmas tree and to your photo ornaments so that they'll stick to one another. After all of the ornaments have velcro on them you are ready to set up your Christmas tree so that kids can play and explore their sense of SIGHT as they look at all of the colorful photos! My kids loved working together to assemble the tree and move the photo ornaments around. My oldest (age 6) had fun telling my youngest (age 2) all about the different things that were happening in each photo since the toddler was only one last year and doesn't remember much about Christmas! My kids enjoyed savoring the photos of their favorite holidays treats and plotting which ones they want to make this year. I think my husband already agreed to make their favorite candy cane cookies with them later today! Once the kids were done hanging all of the photo ornaments then they would pull them down again and put them back up in different places! I especially loved looking at photos when each of the kids were super small and tiny around Christmas time. The activity brought back so many fun memories! Throughout the next several weeks we'll be bringing you a SeeHearTouchTasteSmell Christmas Sensory play series, featuring creative activities that help children to explore the season using their senses. This week’s activities are all focused on using our sense of SIGHT. Here are several of the other activities shared this week! Cathy at NurtureStore has an awesome colorful Sensory Christmas Tree Craft. Kate at Picklebums has some printable Christmas glasses you can explore Christmas photos or favorite holiday sights with. Christie at Childhood 101 has a printable Christmas charades game for you to play together as a family. Ana at Babble Dabble Do has some cool Christmas optical illusions which challenge children to think about what they think they can see. Meri at Meri Cherry shares some neat DIY Santa binoculars so you can be on the look out for Santa. Do you have any favorite Christmas activities you've tried using your sense of sight? I'd love you to share them with me! LOVE this! Oh my boys would really adore arranging and re-arranging our family on this cute tree! This is such a fun idea! My four year old would love this! I'm thinking of doing something like this for my 85 yr old Mom, who has dementia. What a great idea for my three little ones! Added a link to this in today’s AllBabyForBaby blog post. This would be so great for young ones with families who are out of town. Ornaments with Grandma and Grandpa and cousins... Oh, I love it! I did this but put pictures of family members as they live far away and my toddler just sees them once every year... she loves it and names them all the time... a good way for her to remember them even when they are far away! love this. I'm hoping to do it with felt so it can be used year after year, and just continue to add new photos!